It’s commonly accepted that if you carry a firearm for self-defense, then a knife should also be part of your system. A knife is a simple form of force enhancement that is not susceptible to the mechanical malfunctions that can happen with guns. However, knives come nowhere near a handgun in terms of stopping power and if you have to use a knife for self-defense, you’ll have to get much closer to your adversary than is normally advisable. However, in last resort cases, you’ll be glad you had a knife instead of nothing but your fists. Statistically speaking, it’s highly unlikely that you’ll ever have to use a blade against another person. The knife will usually be used as a tool to cut things like rope and to open packaging, which is useful in and of itself. 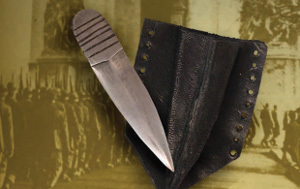 Make a point to actually use the knife you carry as part of your self-defense gear. Always return it to its holster or the pocket you clip it to. Using the knife and returning it to its place will help automate the process of accessing it. If the time should come for you to need to draw it, you’ll know where it is and be able to get to it without fumbling around. Familiarity with your knife and its location is key to an emergency situation. When it comes to selecting a knife, there are many different makes and styles. Knives aren’t very expensive in the grand scheme of things, so there’s no reason not to own several. You’ll probably end up with one or two that you prefer and that’s normal. When it comes to blade type, keep in mind that no knife holds its edge forever and will need to be sharpened many times throughout its lifespan. So-called stainless steel blades are popular today because they require very little maintenance and aren’t prone to rusting. However, stainless steel blades don’t hold their edge quite as well as high-carbon steel blades. The downside to most knives made of high carbon steel is that they rust more readily. The final decision is largely a personal one. Both metals work well, but there is no reason not to own a few of each style, just to see how they hold up and perform on a day to day basis. Concealed Carry Handguns: You Can’t Just Have One! Being able to mix up your regular carrying routing without sacrificing safety is a great way to stay sharp and on top of things. This means varying your carry style, holster, and even the gun you carry. It can be easy to get stuck in a rut if you only carry the same gun with the same carry method, day in — day out. Your brain can get so used to this routine that if any part of it changes, you are at a loss. Failing to change up your routine can lead to complacency, which is dangerous. In the grand scheme of things, good pistols for self-defense aren’t all that expensive. Their cost is miniscule in comparison to many other things you buy multiples of, such as vehicles. Often the gun buying process is approached with the mentality that the gun you ultimately end up buying is the Holy Grail. This will be the one gun you own and the only one you will ever carry. Unfortunately, this can pigeonhole your thinking. Some guns are better for certain situations and it is nice to have options when you’re buckling a weapon into place for the day. If you can afford to purchase one handgun for self-defense, then at some point down the road, you’ll probably be able to buy another one without breaking the bank. It’s sensible to have a few guns to choose from. Much like a selection of apparel, you can pick up the gun that suits you for any occasion on any given day. And remember that like any other possession, handguns can be bought, sold, and traded for other weapons. This is often the most effective way to learn what guns you like the most since you’ve actually been able to own them for a time and have seen how they work in your day-to-day life. 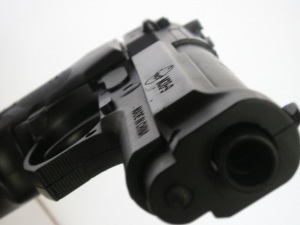 Our decision to carry a firearm for self-defense is at times, a controversial one. The position on gun rights is often attacked with false statistics and statements aimed at cultivating emotional responses that aren’t grounded in reality. It is sad to see people who choose to carry firearms for their own defense demonized and considered dangerous, unstable, or even bad people. It can be helpful to occasionally refresh ourselves with the reasons for our choice to carry and the positive impact concealed carry can make on our lives. Individuals who make the decision to get a concealed carry permit, attend classes, and spend many hours choosing the right handgun, ammunition, and carry system are not doing these things to cause trouble. They are engineering their own self-defense system. These are knowledgeable people who are taking responsibility for their own safety and protection instead of relying on luck or the police. Taking responsibility for oneself is admirable and should be lauded, not treated as barbaric scare tactics or lies. There are those who say that we wouldn’t need guns if we simply avoid dangerous areas and situations. These people also believe that the police will protect us. Remember, these types of arguments are not based in reality. All one has to do is pick up a newspaper to see crimes committed across all spectrums of society. Shootings don’t only happen in bad neighborhoods. They happen in gated communities, too. As for the police protecting us, the fact of the matter is that they are not present everywhere 24/7, nor do we want them to be. Most of us cannot afford personal armed bodyguards either. This reduces our options considerably and again, brings us face to face with the only real option at hand: carrying a firearm for self-defense. A responsible citizen in possession of a handgun is prevention. If a criminal succeeds in killing someone, there is no cure that will bring them back. When carrying concealed, you want assurance that your holster is not only comfortable, but also holds your handgun securely. Except, there’s more to it than that. There is also the comfort, the ease of putting your holster on and taking it off, and the overall cost. This is exactly where the Galco M7X Matrix comes in. Some weapons, such as the Springfield Armory XD-M .45, come with their own holsters, but this doesn’t necessarily mean that they are the best fit or design for the weapon or your body. A comfortable and secure option such as the Galco M7X is not only an outside waistband holster, but it also holds some weapons much higher and tighter than the holster that it came with them. Installation-wise, the M7X is very simple to put on and take off. It has plastic loops that are durable and snap into place easily. 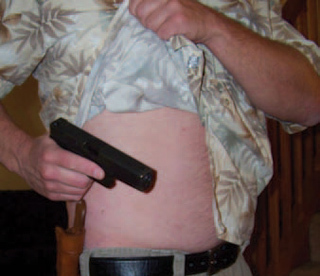 When first using the holster, it may seem a bit uncomfortable as it takes time for it to mold to the carrier’s body. The M7X is also molded for specific handguns and you’ll know it’s secure in place when you hear it ‘click.’ It also supports overall concealment thanks to the non-adjustable forward cant which forces the weapon and holster to ride more up than back. This also allows for a more natural draw, adding to its benefits. When looking for a holster beyond the one that your weapon may automatically accompany, you should seek out something that is comfortable, and affordable. It should aid in concealment, and provide confidence when carrying. 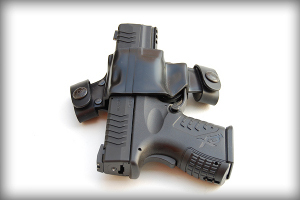 If you’re seeking value and practicality in your holster, look no further than the M7X.